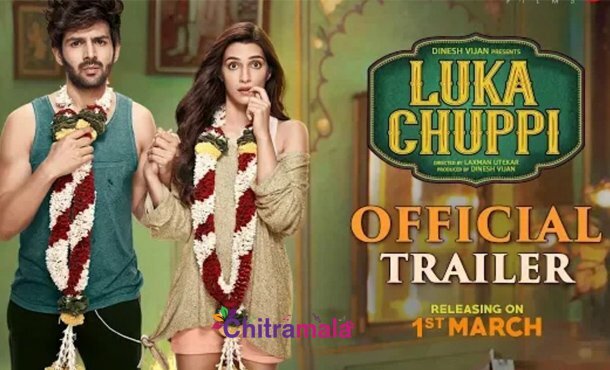 Luka Chuppi is an upcoming romantic comedy film starring Kartik Aaryan and Kriti Sanon. Laxman Utekar is helming this project and the movie has been carrying a decent pre-release buzz. The makers have unveiled the trailer of the film today. The story is all about Kartik Aaryan who falls deeply in love with a headstrong woman Kriti. The 2 and 49 minutes trailer video introduces the characters as well as the premise of the story. The trailer also featured some hilarious scenes when the couple tries to get a house for a live-in relationship, getting caught by their parents, and also the end scene in trailer which are really funny. It seems like the movie is definitely going to give a laugh riot for the audience. Dinesh Vijan under Maddock Films bankrolling this project. Sachin-Jigar is scoring music for the film. The movie is gearing up to hit the screens on March 1st, 2019. Bollywood’s Love pair is getting hitched soon! !